All of us have seen many Websites displaying the number of online users. 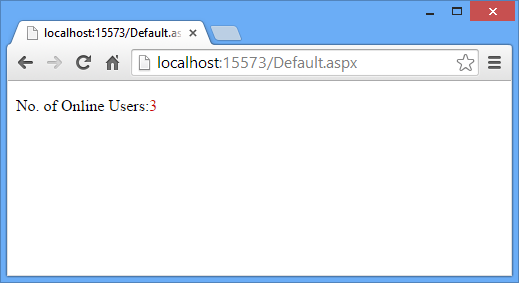 In this Article, We will learn how to Display Number of Online Users in ASP.NET Web Application / WebSite. 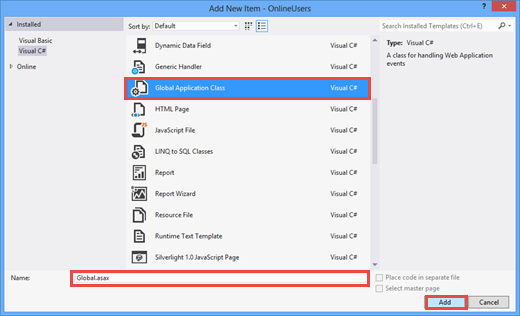 3) Select Global Application Class (Global.asax) -> Click on Add Button. You will see various events of Global.asax file like Application_Start, Application_End etc. Application_Start event called once when application starts. Session_Start event called every time when a new session is start. Session_End event called when a user session ends. In Application_Start Event, We will initialize our Application state variable. 4) Add a Webform and drop a label control from the Toolbox. Run the Application (ctrl+ F5). For checking, copy the url and paste it in the new instance of different browser. When a visitor visit your website, a new session is started for him and Application["TotalOnlineUsers"] variable increased by 1. When user session expires than Application["TotalOnlineUsers"] variable decreased by 1. We can also use Cookieless session by setting cookieless property to true. On running the application, you will see Session ID in URL which is different for all users, sessions, for the new instance of different browser. The session ID is embedded in the URL in the format shown below.